In January, Graeme contacted me to help him optimise his nutrition for cycling to help him to complete numerous endurance events with the main focus being on Alpe d’Huez 2018 in July. This event is over 3 days and consists of a gruelling 146 miles, taking in some of the extreme inclines that feature in the Tour de France. Graeme attempted this last year but due to extreme fatigue due to poor nutrition practices, he was forced to pull out before finishing. He has said he now see’s this event as unfinished business and is determined to complete it this year! 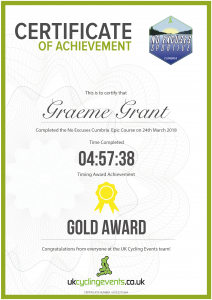 I met up with Graeme on Wednesday, following the No Excuses Sportive in Cumbria on Sunday which he was using as a training event to help prepare for Alpe d’Huez. It consisted of 80 miles with a number of steep inclines. The recent spell of poor weather meant that Graeme had to miss 3 weeks of training on the run up to this event which wasn’t ideal. Despite this, he managed to finish over 17 minutes ahead of the 05:15:00 time required to claim a gold medal which was absolutely fantastic, especially given that he missed a quarter of his training period due to snow. It is amazing to see how much progress Graeme has made in the short time since contacting me. He has noticed a huge improvement in his performance and recovery time and has credited these developments to the changes to his nutrition. With just over 3 months to go and more training events still to go before the main challenge, including a 210 mile race in Holland, there is still a lot of work to do but he feeling much more optimistic and the progress is looking very promising. Keep an eye out for more updates on Graeme’s progress. If you need help with optimising your nutrition for an event, get in touch to find out how I can help you achieve your goals.